Pecans and walnuts may resemble each other in many ways, but they are different when it comes to scientific classification, nutritional content, taste, appearance, and more such factors. The fat content in pecans and walnuts indicates their nutritional similarities. Both these nuts have good fats and a lot of essential vitamins, proteins, and minerals. One cup of chopped pecans contains 753 calories, most of which come from fats. The saturated fat content is a modest seven grams, while the good fat forms most of the fat content in pecans. This includes good amounts of poly- and monounsaturated fats and omega-3 and omega-6 fatty acids. The same quantity of pecans contains 10 grams of protein. On the carbs front, pecans contain 10 grams of dietary fiber and low amounts of naturally present sugars. Pecans are rich in vitamin B—choline, thiamin, B6, folate, and niacin. These nuts also have traces of vitamins A, C, E, and K. Pecans have phytosterols, which are plant-based compounds structurally similar to cholesterol and help keep up the levels of good cholesterol. One cup of chopped walnuts contains 765 calories, most of which come from fats. The total saturated fat content is just seven grams. Walnuts contain high amounts of good fats that consist of omega-3 and omega-6 fatty acids and poly- and monounsaturated fatty acids. These good fats help increase good cholesterol and are actually good for the heart. The protein content in the same quantity of walnuts is 18 grams. As far as carbs are concerned, walnuts have eight grams of dietary fiber and naturally present sugars. Walnuts contain a good amount of the vitamin B group, such as B6, folate, and thiamin. It also contains traces of vitamins C, E, and K. Walnuts are rich in essential minerals like manganese, copper, magnesium, and phosphorus. They also contain some amounts of iron, calcium, and potassium. They are low in sodium. Walnuts also contain phytosterols, which help manage cholesterol levels. Pecans and walnuts offer many common health benefits as they have similarities in their nutritional content. Both of these nuts give you energy and at the same time help you tackle obesity. They are known to boost the brain function and reduce the risk of neurodegenerative diseases. They are rich in antioxidants and have anti-inflammatory properties. Some research stats indicate this; however, more evidence is required to prove this aspect. 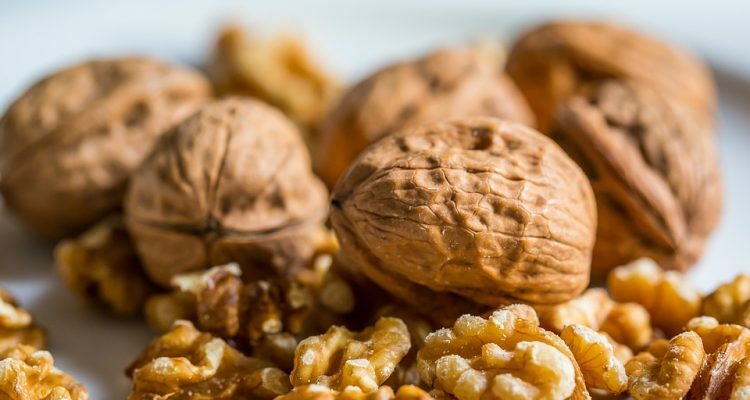 As per a study conducted at Tufts University in Boston, polyphenols in walnuts reduce oxidation and inflammatory load on brain cells and improve the signaling aspect of neurons. Pecans and walnuts are good for heart health, owing to the presence of good fatty acids. The good fats and phytosterols help control the cholesterol levels and increase HDL, or good, cholesterol. It prevents blockage of blood vessels, atherosclerosis, and balances blood pressure levels. Pecans and walnuts also help manage weight and get rid of obesity. The dietary fiber and protein contents are definitely useful to control weight as fiber aids digestion, boosts metabolism, and makes you feel full. Proteins give you energy. The good fats in pecans balance the levels of a hormone called ghrelin, high levels of which are associated with high-stress levels and binge eating. So, if combined with your healthy day-to-day diet of other food ingredients such as green vegetables, eggs, chicken, whole grains, and more, these nuts are bound to help control obesity. Pecans and walnuts are rich in minerals and help build muscle strength and bone mineral density if eaten moderately along with other supplements that provide calcium, such as milk. Walnuts have a typical nutty and slightly sweetish taste. On the other hand, pecans are buttery in taste. Irrespective of these differences, both pecans and walnuts are extremely nutritious. Walnuts are lighter in color and typically resemble the four lobes of our brain protected in a cranium-like covering. Pecans are brown and slightly oval or elongated. The hard covering outside pecans is also slightly oval. Also, pecans have longitudinal ridges on them, while walnuts have slightly uneven ridges. So, in terms of appearance, one can easily identify the difference between both these nuts. After all this pecans vs. walnuts comparison, we can say that both the nuts have good fats and offer amazing health benefits. They could form a healthy mid-morning or afternoon snack. They are best when eaten raw; however, pecans can also be cooked and used in various recipes. You can use raw walnuts in salads, shakes, desserts, and more. A word of caution would be for people who are allergic to nuts. They should stay away from both these nuts or consult their doctor in case of any newfound symptoms.